[S24] Victor L. Bennison, The Loop Family in America (n.p. : Penobscot Press, 1992), p. 56 (naming Philip Loop as her father). [S24] Victor L. Bennison, The Loop Family in America, above, p. 56 (naming Elizabeth Linkenhoker as her mother). [S24] Victor L. Bennison, The Loop Family in America, above, p. 56. [S24] Victor L. Bennison, The Loop Family in America (n.p. : Penobscot Press, 1992), p. 56 (naming Philip Loop as his father). [S24] Victor L. Bennison, The Loop Family in America, above, p. 56 (naming Elizabeth Linkenhoker as his mother). [S24] Victor L. Bennison, The Loop Family in America (n.p. : Penobscot Press, 1992), pp. 56-57 (naming Philip Loop as his father). [S24] Victor L. Bennison, The Loop Family in America, above, pp. 56-57 (naming Elizabeth Linkenhoker as his mother). [S24] Victor L. Bennison, The Loop Family in America, above, p. 57. Marriage*: He married Rebecca Schenck. [S24] Victor L. Bennison, The Loop Family in America (n.p. : Penobscot Press, 1992), p. 57 (naming John Henry Loop as his father). [S24] Victor L. Bennison, The Loop Family in America, above, p. 57 (stating that Elizabeth _____ probably was his mother). Marriage*: She married Simon Loop, son of John Henry Loop and Elizabeth _____. [S24] Victor L. Bennison, The Loop Family in America (n.p. : Penobscot Press, 1992), p. 57. [S24] Victor L. Bennison, The Loop Family in America, above, p. 57 (naming John Loop, Jr. as her father). [S24] Victor L. Bennison, The Loop Family in America, above, p. 57 (naming Nancy _____ as her mother). [S24] Victor L. Bennison, The Loop Family in America (n.p. : Penobscot Press, 1992), p. 57 (naming John Loop, Jr. as her father). [S24] Victor L. Bennison, The Loop Family in America (n.p. : Penobscot Press, 1992), p. 57 (naming John Henry Loop as her father). [S24] Victor L. Bennison, The Loop Family in America, above, p. 57 (stating that Elizabeth _____ probably was her mother). Marriage*: He married _____ _____. [S24] Victor L. Bennison, The Loop Family in America, above, p. 57 (naming Joseph M. Loop as his father). Marriage*: She married Joseph M. Loop, son of John Henry Loop and Elizabeth _____. [S24] Victor L. Bennison, The Loop Family in America (n.p. : Penobscot Press, 1992), p. 57 (naming Joseph M. Loop as his father). [S24] Victor L. Bennison, The Loop Family in America (n.p. : Penobscot Press, 1992), p. 57 (naming Lewis Loop as her father). [S24] Victor L. Bennison, The Loop Family in America (n.p. : Penobscot Press, 1992), p. 57 (naming Lewis Loop as his father). [S24] Victor L. Bennison, The Loop Family in America, above, p. 57 (naming Nancy _____ as his mother). [S24] Victor L. Bennison, The Loop Family in America, above, p. 57 (stating that she was born "about 1831 or 1833"). [S24] Victor L. Bennison, The Loop Family in America, above, p. 57 (naming John Anderson Loop as her father). [S24] Victor L. Bennison, The Loop Family in America, above, p. 57 (naming Annie R. _____ as her mother). [S24] Victor L. Bennison, The Loop Family in America (n.p. : Penobscot Press, 1992), p. 57 (naming John Anderson Loop as her father). Charles Linneaus Loop, from Bennison's The Loop Family in America, p. 64. Other Names*: Charles Loop, C. L. Loop. [S24] Victor L. Bennison, The Loop Family in America (n.p. : Penobscot Press, 1992), p. 58 (naming Simon Loop as his father). [S24] Victor L. Bennison, The Loop Family in America, above, p. 58 (naming Mary C. Davis as his mother). [S24] Victor L. Bennison, The Loop Family in America, above, p. 58. [S24] Victor L. Bennison, The Loop Family in America, above, p. 58 (stating that they married in 1871, probably in Memphis, TN"). 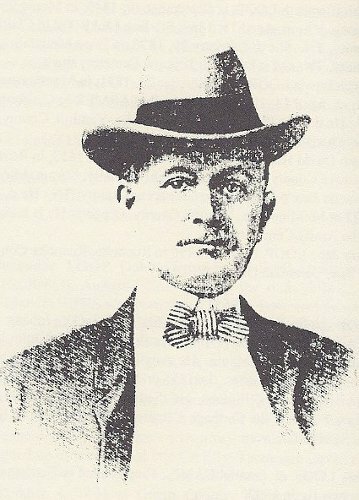 [S1438] Nashville Tennessean, Nashviolle, Tenn., online at http://www.newspapers.com, 18 Nov 1915, p. 2, col. 5 (obituary of C. L. Loop) (stating that he died at 7:30 a.m.). [S961] Find A Grave, online at http://www.findagrave.com, memorial for Charles Linneaus Loop, memorial no. 8610300, viewed on 10 Jul 2011. [S1438] Nashville Tennessean, Nashville, Tenn., above, 18 Nov 1915, p. 2, col. 5. 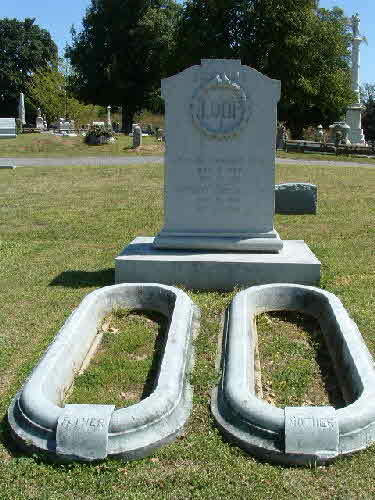 Harriett Yerger Loop and husband's cemetery plot, Elmwood Cemetery, Memphis, Tenn., from findagrave.com. Other Names*: Harriett Yerger, Harriett Yerger Loop, Harriett Loop, Harriet Yerger, Harriet Yerger Loop, Harriet Loop. [S24] Victor L. Bennison, The Loop Family in America (n.p. : Penobscot Press, 1992), p. 58 (stating that they married in 1871, probably in Memphis, TN"). [S1438] Nashville Tennessean, Nashviolle, Tenn., online at http://www.newspapers.com, 11 Oct 1900, p. 2, col. 2 (obituary of Mrs. Harriet Yerger Loop) (stating that she died that morning of typhoid fever). [S1438] Nashville Tennessean, Nashville, Tenn., above, 11 Oct 1900, p. 2, col. 2. [S24] Victor L. Bennison, The Loop Family in America, above, p. 58 (stating that he was born "about 1843 probably in Thorntown, Boone County, Indiana"). [S1404] "Daniel Corbit Bible," typescript included in "Historical Society of Pennsylvania Family Collection, vol. 0116," online at http://www.familysearch.org (not giving the date but stating that she was aged thirty-three years, ten months, and eight days when she died). [S721] Encyclopedia of Delaware (Wilmington, Del. : Aldine Pub. & Engraving Co., 1882), (biography of Daniel Corbit) (not giving the date). [S1404] "Daniel Corbit Bible," above. [S961] Find A Grave, online at http://www.findagrave.com, memorial for Mary Pennell Corbit, memorial no. 10043550, viewed on 13 Jul 2011 (giving the year but no other information). [S721] Encyclopedia of Delaware (Wilmington, Del. : Aldine Pub. & Engraving Co., 1882), (biography of Daniel Corbit) (naming Mary Pennell as his mother). [S1404] "Daniel Corbit Bible," above (naming Mary Pennell as his mother). [S1404] "Daniel Corbit Bible," typescript included in "Historical Society of Pennsylvania Family Collection, vol. 0116," online at http://www.familysearch.org (naming Mary Pennell as his mother). [S721] Encyclopedia of Delaware (Wilmington, Del. : Aldine Pub. & Engraving Co., 1882), (biography of Daniel Corbit) (naming William Corbit as his father). [S1404] "Daniel Corbit Bible," above (naming William Corbit as his father). [S248] Supposition as to place, based on family's believed residence at the time. [S1404] "Daniel Corbit Bible," above (not giving the place). [S1404] "Daniel Corbit Bible," above (stating that he died at "about" 9:00 p.m. at age forty-two years, six months, and three days). Other Names*: Sarah Fisher Corbit, Sarah Corbit. [S1404] "Daniel Corbit Bible," typescript included in "Historical Society of Pennsylvania Family Collection, vol. 0116," online at http://www.familysearch.org (stating that she was aged thirty-one years, one month, and two days when she died on 28 Feb 1789). [S961] Find A Grave, online at http://www.findagrave.com, memorial for Sarah Fisher Corbit, memorial no. 10043551, viewed on 13 Jul 2011. [S1404] "Daniel Corbit Bible," above (naming Sarah Fisher as her mother). [S721] Encyclopedia of Delaware (Wilmington, Del. : Aldine Pub. & Engraving Co., 1882), (biography of Daniel Corbit) (naming Sarah Fisher as his mother). [S1405] J. R. Witcraft, comp., Todds of the Eastern Shore Maryland (Philadelphia, Pa.: Dispatch Publishing House, 1912), online at http://www.familysearch.org, (naming Sarah Fisher as his mother). [S1405] Todds of the Eastern Shore Maryland, above, (naming William Corbit as his father). [S1404] "Daniel Corbit Bible," typescript included in "Historical Society of Pennsylvania Family Collection, vol. 0116," online at http://www.familysearch.org (stating that he was age thirty-eight years and eleven days when he died on 2 Nov 1827). [S1404] "Daniel Corbit Bible," above (stating that he died at age thirty-eight years and eleven days). [S721] Encyclopedia of Delaware (Wilmington, Del. : Aldine Pub. & Engraving Co., 1882), (biography of Daniel Corbit). [S961] Find A Grave, online at http://www.findagrave.com, memorial for Mary Cowgill Corbit, memorial no. 7742306, viewed on 13 Jul 2011 (giving the year but no other information). [S961] Find A Grave, online, above, memorial for Mary Cowgill Corbit, memorial no. 7742306, viewed on 13 Jul 2011. [S1404] "Daniel Corbit Bible," above (stating that she died at about 3:00 a.m. at age eighty-four years, one month, and nine days). [S721] Encyclopedia of Delaware (Wilmington, Del. : Aldine Pub. & Engraving Co., 1882), (biography of Daniel Corbit) (naming Mary Cowgill as his mother). [S1404] "Daniel Corbit Bible," above (naming Mary Cowgill as his mother). [S721] Encyclopedia of Delaware (Wilmington, Del. : Aldine Pub. & Engraving Co., 1882), (biography of Daniel Corbit) (naming Mary Cowgill as her mother). [S1404] "Daniel Corbit Bible," above (naming Mary Cowgill as her mother). [S721] Encyclopedia of Delaware (Wilmington, Del. : Aldine Pub. & Engraving Co., 1882), (biography of Daniel Corbit) (naming John Cowgill as her father). [S1404] "Daniel Corbit Bible," typescript included in "Historical Society of Pennsylvania Family Collection, vol. 0116," online at http://www.familysearch.org (naming Mary Cowgill as his mother). [S1404] "Daniel Corbit Bible," above (giving the date but not the place). [S1404] "Daniel Corbit Bible," above (stating that he died at 4:20 a.m. at age thirty-nine years, eight months, and fifteen days). [S721] Encyclopedia of Delaware (Wilmington, Del. : Aldine Pub. & Engraving Co., 1882), (biography of Daniel Corbit) (naming William Corbit as her father). [S1404] "Daniel Corbit Bible," typescript included in "Historical Society of Pennsylvania Family Collection, vol. 0116," online at http://www.familysearch.org (naming William Corbit as her father). [S1404] "Daniel Corbit Bible," above (stating that she died at age twenty-seven years, eleven months, and eleven days). [S1404] "Daniel Corbit Bible," typescript included in "Historical Society of Pennsylvania Family Collection, vol. 0116," online at http://www.familysearch.org (naming William Corbit as his father). [S1404] "Daniel Corbit Bible," above (giving the date not the place). [S1404] "Daniel Corbit Bible," above (stating that he died at 6:30 p.m. at age eighteen years, five months, and twenty-five days). [S961] Find A Grave, online at http://www.findagrave.com, memorial for Sarah Corbit Spruance, memorial no. 7806935, viewed on 13 Jul 2011. [S1404] "Daniel Corbit Bible," above (naming Sarah Corbit Spruance as his mother). [S1404] "Daniel Corbit Bible," above (naming Sarah Corbit Spruance as her mother). 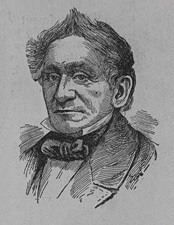 Sen. Presley Spruance, from Biographical Directory of the United States Congress online. • His biography in Biographical Directory of the United States Congress is here. [S1213] Biographical Directory of Congress, online at http://bioguide.congress.gov,s.v. Presley Spruance, viewed on 13 Jul 2011. Marriage*: He married Margaret Traylor. [S1214] Garrett B. Drummond, Jr., A Recollection of My Grandparents and as Told by Those Who Also Knew Them (n.d.), online at http://www.rabgenealogy.com/ui41.htm. Mr. Drummond provided a copy of this typewritten work to Roger Bartlett. [S1214] Garrett B. Drummond, Jr., A Recollection of My Grandparents and as Told by Those Who Also Knew Them, above (naming William Drummonds as his father). Marriage*: She married William Drummonds. [S1214] Garrett B. Drummond, Jr., A Recollection of My Grandparents and as Told by Those Who Also Knew Them (n.d.), online at http://www.rabgenealogy.com/ui41.htm (naming Margaret Traylor as his mother). Mr. Drummond provided a copy of this typewritten work to Roger Bartlett. [S24] Victor L. Bennison, The Loop Family in America (n.p. : Penobscot Press, 1992), p. 61 (naming Lewis Loop as his father). [S24] Victor L. Bennison, The Loop Family in America, above, p. 61 (naming Lavinia Brown as his mother). [S24] Victor L. Bennison, The Loop Family in America, above, p. 61. [S24] Victor L. Bennison, The Loop Family in America (n.p. : Penobscot Press, 1992), p. 61. [S24] Victor L. Bennison, The Loop Family in America (n.p. : Penobscot Press, 1992), p. 61 (naming Lewis Loop as her father). [S24] Victor L. Bennison, The Loop Family in America, above, p. 61 (naming Lavinia Brown as her mother). [S24] Victor L. Bennison, The Loop Family in America (n.p. : Penobscot Press, 1992), pp. 61-62 (naming Lewis Loop as her father). [S24] Victor L. Bennison, The Loop Family in America, above, pp. 61-62 (naming Lavinia Brown as her mother). [S24] Victor L. Bennison, The Loop Family in America, above, p. 62. [S24] Victor L. Bennison, The Loop Family in America, above, p. 62 (stating she married 18 Jun 1873 in New Tazewell "perhaps to Campbell COLE"). [S24] Victor L. Bennison, The Loop Family in America (n.p. : Penobscot Press, 1992), p. 62 (stating she married 18 Jun 1873 in New Tazewell "perhaps to Campbell COLE"). [S24] Victor L. Bennison, The Loop Family in America (n.p. : Penobscot Press, 1992), p. 62. [S24] Victor L. Bennison, The Loop Family in America (n.p. : Penobscot Press, 1992), p. 62 (naming Lewis Loop as her father). [S24] Victor L. Bennison, The Loop Family in America, above, p. 62 (naming Mariah Dickens as her mother).